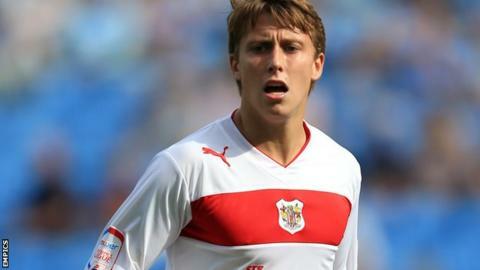 Luke Freeman's late strike against Walsall sealed a first win in 11 games for already-relegated Stevenage. Boro took the lead when Jimmy Smith found some space and fired home from close range, before the visitors struck twice in five minutes after the break. Malvind Benning latched on to Milan Lalkovic's pass to score and Craig Westcarr tapped in, with Jo N'Guessan then equalising with a neat finish. Freeman completed the comeback for relegated Boro with an easy tap-in. "It's a strange feeling winning at home, unfortunately. It's been a long hard season, a trial for the fans, who were again here for us today, and I'm delighted the boys have been able to give them something to smile about. "We weren't brilliant. We didn't play great football, but we did work at the basics, and those basics saw us home with a good three points. "I think Jimmy's (Smith) been brilliant for us this season. He's been a real man about things, he's obviously not happy being part of a losing side, but he's knuckled down every day and set really high standards. If everyone lived up to Jimmy's standards I think we'd be in a different place." Match ends, Stevenage 3, Walsall 2. Second Half ends, Stevenage 3, Walsall 2. Rohdell Gordon (Stevenage) wins a free kick in the attacking half. Corner, Walsall. Conceded by Luke Jones. Attempt blocked. James Baxendale (Walsall) right footed shot from outside the box is blocked. Substitution, Walsall. Michael Ngoo replaces Adam Chambers. Substitution, Stevenage. Michael Doughty replaces Joseph N'Guessan. Goal! Stevenage 3, Walsall 2. Luke Freeman (Stevenage) left footed shot from the centre of the box to the centre of the goal. Attempt missed. Andrew Butler (Walsall) header from the centre of the box is close, but misses to the left following a corner. Corner, Walsall. Conceded by Bira Dembele. Substitution, Walsall. James Baxendale replaces Milan Lalkovic. Attempt missed. Bira Dembele (Stevenage) right footed shot from outside the box is close, but misses to the left. Attempt missed. Roarie Deacon (Stevenage) right footed shot from outside the box is close, but misses to the left. Craig Westcarr (Walsall) wins a free kick in the defensive half. Foul by Luke Jones (Stevenage). Attempt saved. Malvind Benning (Walsall) left footed shot from outside the box is saved in the top left corner. Bira Dembele (Stevenage) is shown the yellow card. Febian Brandy (Walsall) wins a free kick in the defensive half. Foul by Bira Dembele (Stevenage). Substitution, Stevenage. Roarie Deacon replaces Fejiri Okenabirhie. Attempt missed. Febian Brandy (Walsall) right footed shot from outside the box is close, but misses to the right. Peter Hartley (Stevenage) wins a free kick in the attacking half. Corner, Walsall. Conceded by Peter Hartley. Conor Henderson (Stevenage) is shown the yellow card. Hand ball by Conor Henderson (Stevenage). John Mousinho (Stevenage) wins a free kick on the left wing. Attempt missed. Romaine Sawyers (Walsall) right footed shot from the centre of the box is too high. Attempt blocked. Febian Brandy (Walsall) right footed shot from the centre of the box is blocked. Craig Westcarr (Walsall) wins a free kick on the right wing. Goal! Stevenage 2, Walsall 2. Joseph N'Guessan (Stevenage) right footed shot from the centre of the box to the bottom right corner. Assisted by Jimmy Smith.